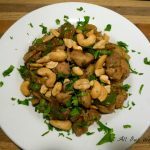 A spicy chicken dish that combines a little tang along with salty, sweet and crunchy, ending in a completely satisfying main dish. 1 cup raw cashews plus more for garnish. In a medium pot over medium heat combine 1 tablespoon extra-virgin olive oil and 1 tablespoon butter. When butter melts into oil, add in the chopped onion, cook 2 minutes, then add rice and cook 3 minutes more. Add stock and cover the pot. Raise heat to bring stock to a rapid boil. Once the stock boils, reduce heat to low and cook, stirring occasionally, until rice is tender, 17-18 minutes. While rice cooks, make the chicken. Heat a large skillet over high heat. Add the 2 tablespoons extra-virgin olive oil, then the chicken. Season the chicken with grill seasoning. Brown the chicken on all sides, season with soy sauce then remove chicken and set aside. In the same pan add the remaining 1 tablespoon of butter and add the remaining onions, garlic and peppers. Cook 2 to 3 minutes then add water chestnuts, green peas , the chicken and mix together. Add the chipotles and cumin. Toss to coat. Glaze the mixture with honey and maple syrup and turn off the heat. ** If you can't find the chipotle in adobo you can substitute 11/2 tablespoons ground chipotle powder. Have all the ingredients prepared ahead of time and the steps fall together easily.